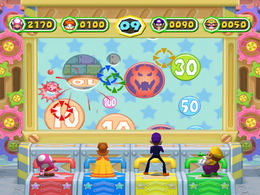 Hyper Sniper is a battle minigame found in Mario Party 6. The players hit targets showing a Mushroom, Fire Flower, Star, and Cloud. The target screen then begins to scroll as the game starts. Players equipped with a type of gun attempt to shoot the target points to earn points within the time limit as the target moves by. The number shown on the target players hit tell how many points they earn. If one of the players shoots a Bowser target, the player will lose all of the points. The player with the most points at the end of the game wins. This minigame appears as the second to last minigame in Decathalon Park. Here, the player's objective is to get the highest score as possible to earn as much points as possible, up to a maximum of 1,000. The default record for this minigame in Decathalon Park is 500 points. The target screen stops scrolling and all players turn around. The winner(s) then perform(s) their victory animation. Rules – "Fire at targets as they scroll down the screen. Whoever scores the most points wins!" Advice – "Beware of Bowser targets! If you hit one, your points will be reset back to zero." This page was last edited on March 27, 2019, at 00:25.